This fusion dish is an excellent way to incorporate quinoa into a traditional Indian diet. First, wash the quinoa and add 2 cups of water. Cook it in the pressure cooker (one whistle is enough). Stove top cooking: If you are cooking without using pressure cooker you should add 2 ½ cups of water to cook quinoa in a pan directly on the stove top. Heat the oil in the pan on a medium high heat. Add the ingredients in this order: Mustard seeds (once it starts popping), then add channa dal, urad dal, dry red chillies, curry leaves, turmeric, hing, onion, and finally asparagus. Mix well and close the lid to cook it. Check the asparagus often until it gets tender. Add cooked quinoa, along with salt and vangibath powder. Mix everything thoroughly and close the lid for a minute so it can absorb all the essence and flavor of the other ingredients. After a minute turn off the heat. 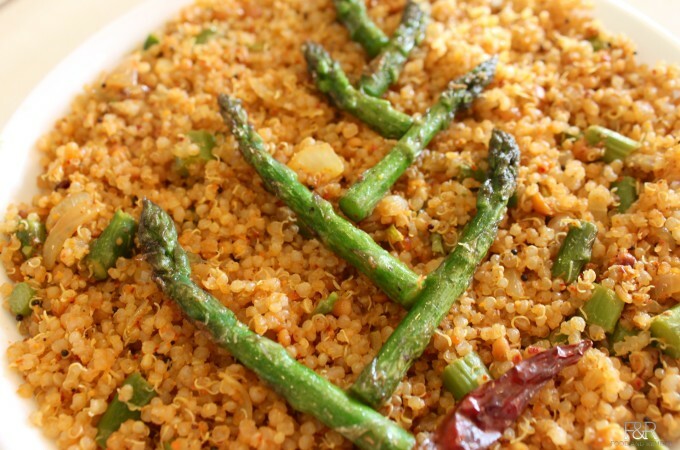 Quinoa-Asparagus Bath is ready to savor. You can serve this as a main course or a side dish this goes well with raitha and plain curd.